While the Society is based and incorporated in the United States, we represent Victims, Advocates, and active Anti-Scam Professionals, Groups, and Organizations all around the globe. 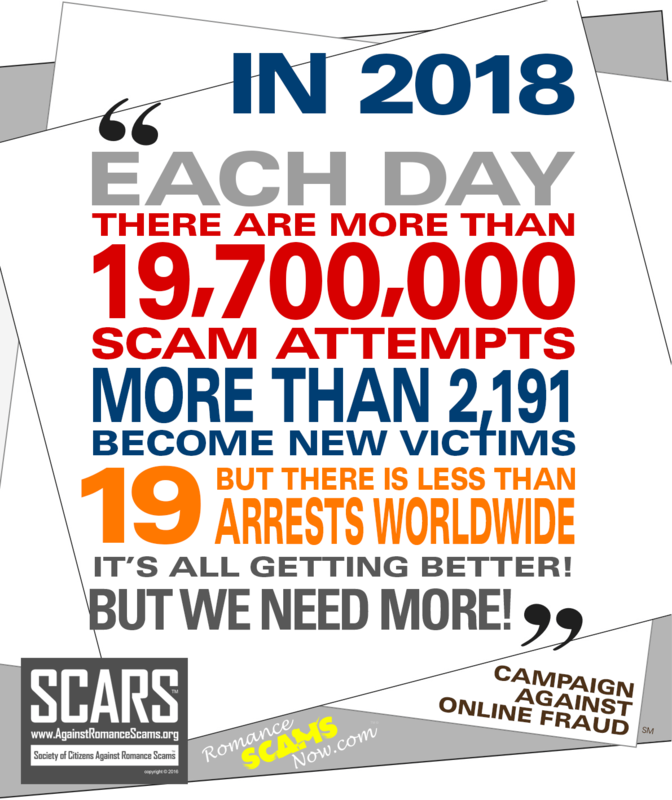 SCARS represents nearly 1,000,000 people (as of December 15th, 2018) and is the largest and fastest growing body dedicated to changing the world of online fraud and cybercrimes for the sake of everyone. We hope that you will help us by adding your voice and supporting us, not with your money, but with your energy! Why Does This Matter So Much? We hope that you will help us by adding your voice and supporting us, not with your money, but with your energy! The Society requires that all members follow a Code of Conduct that establishes professional ethical behavior and conduct in their activities relating to the publication of anti-scam information, and in their interactions with victims of online crimes. Please view our Code of Conduct and FAQs for more information.